It’s a good weekend for FPS junkies! While Apex Legends finally saw the release of its Battle Pass and first new Legend in the form of Octane, Ubisoft has announced the availability of an open beta for their upcoming first-person multiplayer arcade VR shooter, Space Junkies. The beta runs until March 25, 2019 and features a bunch of content to dive into until it ends. We have all the details below. As this is an open beta, anyone who wants to play Space Junkies can simply head to Ubisoft’s website and register their interest. You’ll need to have an Ubisoft account, which is free to create if you don’t already have one. Two simple questions will be asked upon signup: the headset you wish to play on, and the graphics card being used (the PlayStation 4 is a choice here). That’s all there is to it! 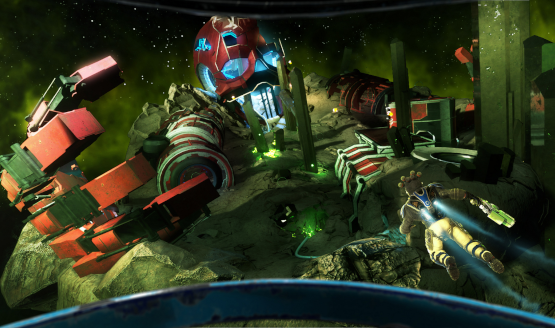 In a rare but increasingly common move, Space Junkies will support cross-platform play. The full game supports the PlayStation VR, Oculus Rift, HTC Vive, and Windows Mixed Reality headsets. It seems if you have a headset made in the last few years, chances are it’s supported by Space Junkies. The PS4 has the easiest requirements, as it doesn’t have any sort of CPU, GPU, or RAM specs to worry about. Normally, allowing cross-play between consoles and PCs gives PC players an advantage, since they can use the much more accurate mouse and keyboard interface. In VR, controls are almost the same. Accuracy is probably determined by some sort of hybrid of looking at your target and aiming a motion controller, and if that is the case, then things are more evenly balanced. Space Junkies is billed as a fast-paced first-person shooter that is set in low or zero-G orbital arenas called “orenas.” (That part sounds a bit like Lawbreakers. )It also features 15 different characters. How each of those characters play is anyone’s guess, though now that the open beta is live, they are each usable by players. Are you going to check out the Space Junkies open beta? Is the prospect of cross-platform play appealing? Have you already sunk a few hours into the game? Let us know your thoughts below. Space Junkies is set to release on March 26, 2019.